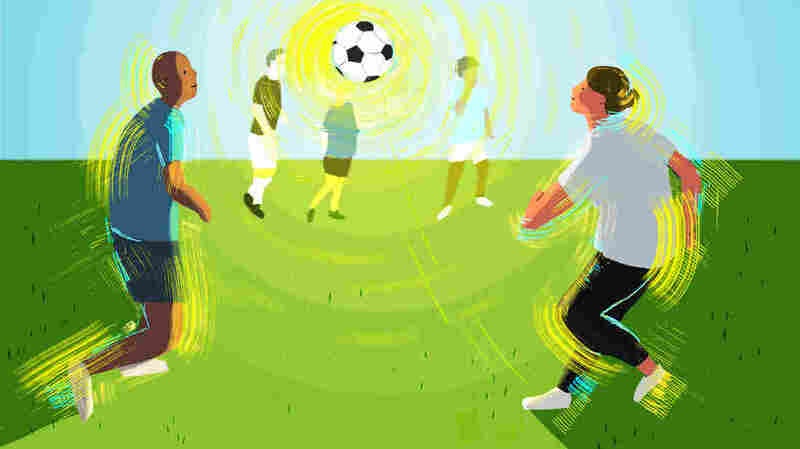 To Boost Mental Health, Try Team Sports Or Group Exercise : Shots - Health News Most people who struggle with depression and anxiety have heard that exercise is a mood-booster. But exercising with friends, especially playing a team sport may help even more. Ryan "China" McCarney has played sports his entire life, but sometimes he has to force himself to show up on the field to play pick-up soccer with his friends. "I'm dreading and I'm anticipating the worst. But I do it anyway. And then, it's a euphoric sensation when you're done with it because you end up having a great time," says McCarney. McCarney was just 22 when he had his first panic attack. As a college and professional baseball player, he says getting help was stigmatized. It took him six years to get professional support. He still struggles with depression and social anxiety, but says exercising helps him — especially when it's with his teammates. One of the study's authors, Adam Chekroud, an assistant adjunct professor at Yale's School of Medicine, thinks team activity could add another layer of relief for sufferers of mental illness. "Some sports might just be hitting on more of those elements than other sports," he says. "If you just run on a treadmill for example, it's clear that you're getting that biological stimulation. But perhaps there are other elements of depression that you're not going to be tapping into." Now, this study only shows an association between group exercise and improved mental health, and can't prove that the one causes the other. But, given what is known about depression in particular, it adds up, says Jack Raglin, a professor in the department of kinesiology in the School of Public Health at Indiana University, Bloomington. People who are depressed often isolate themselves, he says, so exercising in a group setting, "can help alleviate symptoms and deal with this very pernicious symptom of depression." The study showed that "very simple forms of social support can be beneficial," he says. Scientists don't know the exact mechanism that makes exercise elevate mood and decrease anxiety, but there is a body of research to show that it does work on the short and long term. "If you conceptualize exercise as a pill it means, well it's a rather small pill and easy to take and easy to tolerate," says Raglin. One limitation of the Lancet Psychiatry study is the data are based on patients self-reporting their symptoms. Dr. Antonia Baum, a psychiatrist and the past president of the International Society for Sports Psychiatry says patients don't always give an accurate picture of their mental health. She says the study is an important step in this research field, but the conclusions shouldn't be taken as scientific gospel. "We are animals. We are meant to move and if we don't, a lot of systems slow down, including our mood and cognition," says Baum. "So it makes intuitive sense that exercise is beneficial, but it's nice to try to start to wrap our arms around being able to quantify and qualify that in some ways." "It's all well and good to conclude that exercise whether it's done as a solo or a group pursuit is beneficial, but to get patients to do it is another matter and when you have a depressed patient motivation is often lacking," she says. "It's not just exercises that people stop doing, they also stop taking medications. They stopped showing up for therapy," he says. "Adherence is a big problem in health care right now,"
He says the study's findings could lead to more tools to help people reduce the overall burden of mental illness, now the leading contributor to the global burden of disability. "The field is really crying out for things that we can do to help people with mental health issues," says Chekroud. For McCarney, team sports have helped him get a handle on his symptoms, he says. Before social gatherings, he often feels claustrophobic and panicked, but when he works through the anxiety and gets onto the field, he says it's always worth it. "It just gets you around people which I think is another huge thing when you're trying to maybe break out of a depressive cycle," he says. Find a sports ambassador. Raglin recommends finding a "sports ambassador," a friend who can connect you with a group sport or activity. The friend can get you up to speed on the sport and what's expected of you. Team sports may feel like a leap of faith, says Baum. But, she says the rewards are worth it. "It's like playing in an orchestra — the sum being greater than the parts — truly thrilling when it all comes together," she says. Match your skill level. It's not hard to find amateur sports teams to join, on sites like Meetup.com. A lot of workplaces also have team sport activities, but Raglin says you make sure the skill level is right for you. You're more likely to have a good experience and want to go back. "There is nothing worse than being on a team where the skill or intensity of the players is way above or below your own level or the level of competition you were looking for," Raglin says. Join a run or bike club. If you're not into team games, go to your local run shop or bike shop to find run communities, bike clubs or community rides to join. Raglin recommends the November Project, which is a free fitness program with chapters in major cities around the world that hosts workouts. Put money on the line. If you really aren't into team activities, Baum says getting a personal trainer or signing up for a gym can "help add a social element, and that all important accountability." Try the obvious thing first. Baum says to look at the activities you've done throughout your life and think about which ones worked best for you. She says she sometimes takes her patients running or walking with her for a therapy session to start modeling the types of exercises that could work for them.